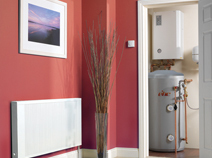 EHC have developed affordable cost effective product range to accommodate almost any Central Heating and Hot Water requirements including Gas Boilers, Electric Boilers, Electric Radiators, Unvented Stainless Steel Cylinders, Solar Products, Water Heaters, Towel Rails, Low Water Content Wet System Radiators and Electric Fireplace Suites. Ideal for retrofit and new build installations requiring heating only or heating and hot water. Either a direct or indirect cylinder for hot water purposes will be required. Due to their compact size these system boilers can be easily situated in airing or kitchen cupboards. All Fusion products can be installed with any type of wet system radiator, but for improved performance and running costs we strongly recommend our Mercury Radiators to complement your system. The Slimline model requires an expansion vessel which is not supplied with the unit. The Comet Electric Boiler is the outcome of many hours of product development which has taken Electric Boiler Technology to a new level. This outstanding Boiler has all the hallmarks of the traditional Fusion range however with its improved appearance and size coupled with state of the art components it is without question the best value Electric Boiler on the market today. Apart from its modern sleek design the key developments within the unit include an Automatic Bypass, Digital Pressure Sensor, Integral Magnetic Filter and Stainless Steel Heat Exchanger. The Comet range includes 6, 9, 12 and 14.4kW models in single phase and a 24kW 3- Phase model. This is a fully packaged unit in a pre-fabricated elegant enclosure complete with all the components required to provide both heating and hot water for retrofit and new build installations. Generally this unit would be located in a typical airing cupboard, however due to its ‘Plug and Play’ design it can be positioned in any similarly sized area. This versatile product can be supplied in various outputs and capacities to accommodate most installations. The Solar version has been designed to meet the ever increasing requirement for renewable technology within the new build market and the energy conscious retrofit buyer. Built around the proven technology of our Fusion E10 Combination Unit, the E10 Solar Combi has been further developed to include a solar pump station and unvented solar hot water cylinder. With the additional solar components, the SAP rating of the property is increased as the carbon emission profile is reduced. All Fusion products can be installed in under-floor heating applications. Unlike most electric boilers, Fusion boilers are designed to eliminate unnecessary external plumbing and pipe work. They are the ideal choice for wet central heating and are also suited to underfloor heating systems. Can be used in conjunction with Solar PV Systems to reduce electricity bills. All boilers within the range are suitable for Wet Systems including Underfloor Heating. The compact design of the boiler makes it ideal for heating applications where space is at a premium. The Slim Jim is traditionally installed by professional heating engineers in properties such as apartments, domestic dwellings, holiday homes and light commercial properties. The Slim Jim is a fully controllable electric flow boiler which is designed to maximise cupboard space. The boiler also has an easy-fit front cover for future maintenance purposes. The versatile outputs are 4, 7, 10, 12, and 14.4kW. It can be installed as an open vented system or a conventional sealed system comprising of circulating pump and sealed system kit. A typical heating installation would comprise of the Slim Jim Boiler complete with standard wet system radiators, thermostatic valves, Programmer and room thermostat. The boiler temperature range can be set between 30 degrees and 80 degrees centigrade which also makes it a suitable choice for underfloor heating applications.